By now fans of Mouse Guard have had a chance to see the news about ASP’s restructuring. Obviously, I have known about it for a while now, but waited for the news to go public before talking about it. As one of the earlier additions to the ASP family, I’ve had many interactions with Aki Liao over the years and while I will miss him, I can see that this will be a positive change for the company. I still strongly believe in the vision, quality, and talent Mark Smylie has brought to ASP. 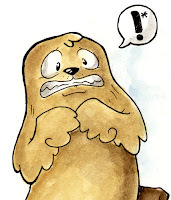 "What does this mean about future Mouse Guard issues and hardcovers?" you may be asking. I have no plans to move Mouse Guard to another publisher. Once the restructuring is complete Mouse Guard will be back on track. I apologize for the delays thus far and hope that the fans can bear with us. The coming weeks should give us a better idea of the timeline for upcoming releases. No matter what, I am fully committed to creating more Mouse Guard and getting it into the fans hands as soon as possible. However, to not dwell on the negative, I always enjoy sitting near two of my favorite artists: Jeremy Bastian and Nate Pride. Their respective girlfriends joined them as well as my wife Julia so it was just a big-old-party behind our tables. Friday night we all made a mad-dash to Home Depot to collect enough PVC pipe and connectors to construct three free-standing banner-holders. At the time is seemed like a huge hassle and very frustrating, but only a few days away from it, I can already see it was a con-memory with good friends I'll always remember. 1) Meeting Katie Cook and her Husband Ryan in person. Katie and I have e-mailed a few times, but never took the time to really connect with each other in person. Julia & I adore her work and she is a bigger Star Wars and Muppet geek than I am! After the show on Sunday Katie and Ryan invited our crew to dinner. It was really cool to just unwind and talk about all sorts of geekdom over delicious food with them. To quote the Great Gonzo "There's not a word yet for old friends you've just met..."
2) Talking with Bill Stolpin. 3) Surprising Jeremy with the Autographed Frankenstein book. 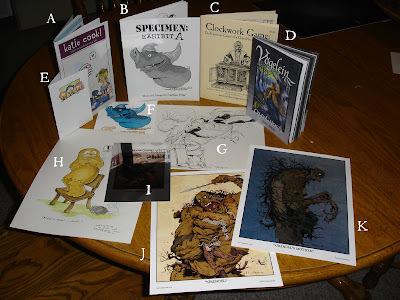 When Julia and I were in Calgary, Julia found a copy of Bernie Wrightson's Frankenstein book (which is IMPOSSIBLE to find from what I understand). Knowing that Jeremy Bastian wanted a copy, I mocked him openly that I had a copy (knowing in my mind that I had every intention of giving it to him). 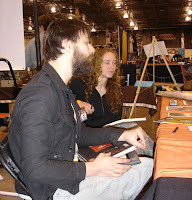 I even taunted him about Bernie being at the MCCC and getting MY book signed. So on Friday I took the book over to Bernie and had him sign it "To Jeremy". When I brought the book back to Jeremy his jaw nearly fell off his head when I showed him the inscription and confessed my intent to give it to him all along. Happy early Birthday pal! It's been a while since I posted, so I haven't been able to share how great the Calgary con was. Julia and I had some travel difficulties getting there, but it was worth it! It's a great show with a very impressive guest list. I met Whilce Portacio, Jim Mafood, Bill Pressing, and Bill Willingham and reconnected with Josh Middleton and Stewart Immonen. I was really impressed with the hardcover art book they publish to bennifit the Boys and Girls clubs of Canada. I didn't get many sketches done at this show (it was very busy for being a smaller convention) but I was able to do this young hellboy. The owner scanned it and I gave it a quick color job as a warm-up for today. Our driver to and from the airport was super-nice-guy Steven Gettis. I had never met him in person, but did a piece for his literature themed blog. And I was able to get another piece done for him. When I was in 2nd grade some of my classmates and I decided we were going to do a play of the Wizard of Oz for our class. We cast roles, rehearsed, planned, conned our folks into making costumes: all without ever getting permission from the teacher to ever preform it. She said "no" our parents, knowing how much work we had all put into it, talked her into sparing a bit of time over 2 days for us to preform it in two parts. I was the tin-woodsman and have always had a soft spot for the character. So here is the moment (with text from the book) Dorothy and Scarecrow find the Woodsman rusted stiff. Had a great time signing at Green Brain Comics in Dearborn, Michigan. I had free prints available for everyone, since I didn't have a Free Comic. Dan and Katie went all out to make all the guests feel well cared for. I met and sat next to James Kochalka who draws 'American Elf' and the upcoming 'Johnny Boo'. Thanks Dan and Katie for the great day! Sean Wang does a great book called Runners. 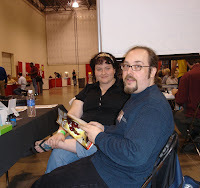 He self published the series of five issues and later a compilation over the course of several years and with the support of his then-girlfriend/now-wife Peggy. Runners is a sci-fi adventure comic that takes a lot of it's cues from the han/chewie parts of Star Wars. When Sean found out that his 2nd Runners series would be picked up by ASP, I was thrilled to do a pin-up for him. It won't be in print for a while because it's slated for the extras section of the collected hardcover (after the issues are published) but I wanted to share it and hopefully get some new people familiar with what I find to be a great comic. The pinup is based on the flashback scenes from Sean's first story arc. They stuck with me enough I had to draw the old crew for myself. 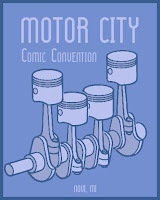 Motor City Comic Con: This weekend is the Motor City Comic Con. I'll be there all three days (though I may be leaving an hour early on Saturday to make it to a cousin's wedding) signing, meeting fans, and sketching. Motor City is always a fun show because of the close friends I have that also set up there like Jeremy Bastian and Nate Pride. June 7th I'll be signing at Ferndale Michigan's only comic shop: Detroit Comics on Woodward from noon to three. If you are in the area, stop by! This one was e-mailed from fan Orlando Ambriz. He says he imagined Celanawe wearing clean linen robes after becoming the Black Axe.